Geospatial Intelligence Imagery Analysts play an integral part in providing Army personnel with critical information about enemy forces, potential battle areas, and combat operations support. They analyze images to help design plans for everything from combat operations to disaster relief. This highly-sensitive job, categorized as MOS 35G, has some stringent requirements but is key to Army intelligence and other operations. These soldiers use all manner of visual data to do their jobs, including aerial imagery, geospatial data, full motion video, and other electronic monitoring. This data helps them design defense plans, including combat plans, and create maps and plans for recovery efforts after a natural disaster. These images may be developed via photographic or electronic sources. MOS 35G will glean intelligence information from these images, and help determine target coordinates, identify enemy weapons and positions, conduct a battle damage assessment, and prepare reports based on their findings. 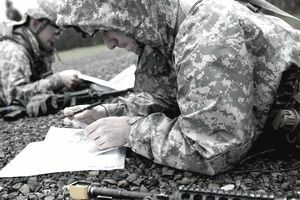 In addition to analyzing images for intelligence information, these soldiers assess where an enemy is vulnerable, and help devise possible courses of action. Job training for a geospatial intelligence imagery analyst requires the usual ten weeks of Basic Combat Training (boot camp) and 22 weeks of Advanced Individual Training (AIT), which is divided between time in the classroom and time in the field. This training takes place at Fort Huachuca in Arizona. Since you'll be handling highly sensitive information in this job, there are some rigorous eligibility requirements. You'll need at least a 101 on the skilled technical (ST) portion of the Armed Services Vocational Aptitude Battery (ASVAB) tests. You'll need to be eligible for a Department of Defense Top Secret security clearance. This process involves a background check and will look at your finances and any criminal background, including drug activity. You must be a U.S. citizen to work as MOS 35G, and members of your immediate family must be citizens as well. Your record must be free of any convictions by court-martial, and free of any convictions by a civil court for anything besides a minor traffic violation. As with most military intelligence jobs, you won't be eligible if you ever served in the Peace Corps. It is because the government wants to allow the humanitarian work the Peace Corps does to remain free of suspicion. If foreign governments thought that Peace Corps volunteers were acting as agents of the military or for intelligence agencies, it would hamper the organization's work and potentially endanger its personnel. Also, and this gets a little unusual, you, your spouse and any immediate family members can't reside in a country where physical or mental coercion is a common practice. You can't have a commercial or vested interest in such a country, either, and neither can your spouse or family members. Talk to your recruiter or senior officer for information about what countries are part of this list. Obviously, there are a fair number of duties for this job that have no civilian equivalent. But the skills you learn will translate for some positions; you'll be qualified to work as a cartographer or surveyor, or as a mapping technician.